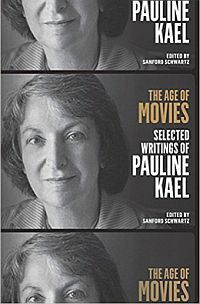 The Age of Movies: Selected Writings of Pauline Kael, ed. by Sanford Schwartz. New York: Library of America, 2011. Hardcover, 750pp, $40.00..
You can tell she’s turned on. There are few writers these days who let themselves be turned on (i.e., able sublimate sexual ignition into their criticism without being juvenile or clinical) like this, so luckily for us we have this enjoyable, comprehensive but easy to carry volume to get us pumped in the old 1970s sense to experience the films she discusses, all the dangerous films from those “horror city” theaters available at our fingertips now, for enjoyment in the privacy of our own homes, and if the element of danger from a “miniature Altamont” theater crowd is gone, Kael’s writing brings it back. She brings the ’70s mix of sexually charged danger and go-for-broke aesthetic surrender back into movie watching. Don’t let the bourgeoisie put up a velvet rope around her and keep you away from this book just because they want to do some grant-spending idolatrous stunt like having an exhibit at MOMA of her typewriter, glasses, favorite film screenings, and original typewritten pages and notes. Fight the power, grab this book, see The Conformist through her eyes, awaken her vision in yourself, and set the both of you free once more, even if it’s only until the next blue credits.